That's a secret inside the kitty. She don't want let anyone know what is that, do you know it? ...I had always wondered what happened to the mice! Very sweet. i love the softness of the lines, looking at it just relaxes me. Very nice! So cute! Full of sweet and charming details! Aww...cute! Love the little mice. Very cute! and yet very neat.. I love the idea, mice inside a cat body. Are they already dead after been eaten by the cat? hehe..
Hey thanx for the greet, I'm hoping to see more from u. So THAT's why kitty always looks so happy! The little mice are tickling her from inside. 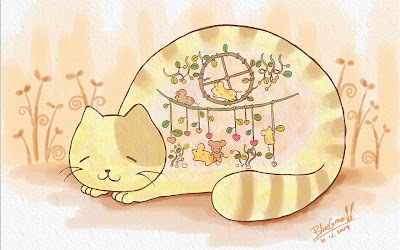 Delightful and adorable drawing! Very cute! I wonder how they pulled that off! It's a wonderful illustration, I'll call her Nina, you know why. Fortunately all the mice she ate were having a party in her big belly!!! So very nice...congratulations. BlueGrass Studio. Powered by Blogger.